! This is NOT a method of direct communication with MARITE FLOWERS & GIFTS - FLORISTERIA MARITE for purposes of ordering or rectifying problems. Me encanto el servicio, muy rapidos y hermoso trabajo! Thanks for your order, it was a pleasure toserved you. It was a pleasure to served you, thanks. Muy agradecida por el arreglo que me enviaron como cortesía por el error que hubo en una entrega previa. Agradezco el gesto tan amable, las flores están hermosas. Las flores lucen frescas y coloridas. Muchas gracias. Hemos construido una extraordinaria reputación, reconocemos que algunas veces las flores pueden haber sufrido daño durante el traslado de E.U. a PR. Estamos a la orden siempre. Gracias Ivelisse me gustaria verte hace muchos años te hice la boda. Felicidades. Excellent service, Beautiful arrangement. Very pleased! Will recommend and will use for future! Puntuales, un arreglo muy bonito. Muy satisfecha. Altamente recomendado. Hice la orden con poco tiempo de anticipación e hicieron la entrega a la hora seleccionada. Gracias por tan bien servicio. The Flowers were absolutely Beautiful ! I honestly had no idea where to order them from and I am so thankful it was from here ! 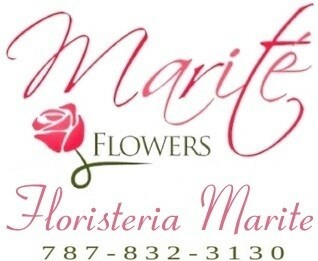 I will never use any other florist in Puerto Rico ! I give them 11 Stars !! My friend loved the arrangement for her birthday. Since she takes care of her dad during the day, it was waiting for her when she arrived home , she says it was a very nice surprise. Una floristería de gran calidad y atención al detalle. Su pronta atención al servicio de su clientela y el hermoso detalle de sus arreglos le dejaran muy satisfechos. A beautiful arrangement carefully and lovingly crafted. Pleased beyond words at the prompt attention and quick delivery of my order. Definitely recommend! I was very pleased with my interaction. The shop worked hard to make sure my order got to the proper location (it was in a tricky location)!and they were very helpful. Plus the flowers were beautiful! Thanks for your order, it was a pleasure to served you. Todo muy lindo igual que el de la foto gracias por todo. It was a pleasure to serve you, thank you very much. Outstanding service !!!!! Five stars !!! As always, fast service, beautiful flower arrangements delivered as expected. Highly recommend Marite 100% to anyone who wants to by flowers for any occassion. Amazing service, they did everything I ask for; when they called my Mom they never told her what it was for, they keeped the surprise like it was for one of their family members. Love it! The best choice you can make. Thanks a lot! Excelent!! On time, super fast service. Muchas gracias, fue un placer servirle, siempre a la orden. Thanks for your order. It was a pleasure to served you. Excelente servicio! Super rapido! Muchas gracias! Wow I was impressed by how fast this service was!! The flower arrangement was beautiful and it sure made my grandma extremely happy. I will definitely use Marite flowers in the future. Estupendo. Quien lo recibio estaba muy complacida con el arreglo! El proceso fue muy facil y ligero por un precio razonable. Lo recomendaria sin pensarlo dos veces. Muchas gracias y estamos siempre a la orden. Nos esmeramos en complacer a nuestros clientes. Not the flower or vase I chose on website. However they called me and sent me a picture of flower arrangement sent which were beautiful. Thanks for your order, it is true we substitute the vase and some flowers. When a customer place an order we specify that in case we do not have the same product will substitute. It was a pleasure to served you. Thanks a lot. The most beautiful flower arrangement I have ever received. The roses were spectacular and the lilies just beautiful. I will let my son know how much I liked them. Saludos y muchas gracias por su orden. Fue un placer servirle. Estamos a la orden. I was having a hard time finding an online site to send flowers to my mother in PR for Mother's Day. I'm originally from Mayaguez and was very happy to see that Marite had a page. The red roses and chocolates I sent arrived on time and the flowers were beautiful! I will definitely order this way again...thanks! Muy satisfecho con el servicio de Marite. tanto las flores como la entrega fueron perfectas!!!!! !Thanks marite Both the flowers and the delivery were spot-on. Will definitely use you again. Highly recommended!!!!!! There has to be a way to let the customer know estimated time of arrival. I’m very happy with the product, but not knowing if it will arrive when the order was indicated, it’s a little unnerving. Saludos, la política para ordenes por internet especifica que no hora de entrega debido a la cantidad de órdenes que tenemos en holidays. Creo que cuando hace la órden en la parte de abajo lo dice. Gracias y lamento el inconveniente. Gracias por su respuesta. Las flores están muy bonitas. The plant was absolutely beautiful the service was excellent, I will recommend to all my family and friends!!! Thanks a lot, it was a pleasure to served you. Gracias Alexis, fue un placer servirte. This time I ordered red roses ! They were beautiful !! Marite Florist as always making beautiful flower arrangements and delivery is super fast !!! This is the second time I order and will continue buying flowers from Marite. Highly recommend 100 % to anyone looking for a Florist service here in the west area of Puerto Rico!! I give 5 stars ! Ordered today few hours ago and already flowers were delivered. My friend sent me pictures of the flowers I chose and were beautiful. Very happy with the service of Marite !!! I highly recommend !! Thank you. My man is in Puerto Rico doing hurricaine relief work and I found this gift basket delivery service to deliver a basket to show him I was thinking about him. I got to send a message and the peice wasn't bad at all! The delivery was very fast! Thank you! As always Marite Floríst does a great job. You guys are amazing. Thanks so much for such a beautiful rose bouquet for my mom. God Bless you always. Como siempre Floristería Marite hace un trabajo excelente. Ustedes son únicos.. Gracias un millón por él ramo de rosas tan hermoso para mi mama. Que papa Dios les de muchas bendiciones siempre. Gracias jefa.. The flowers looked just like what was pictured online. Delivered promptly. Very easy to work with. Thank you. I was not present to see the flowers or know that they were there in time. However, the person that they were for seemed pleased and thanked us. Buen producto . Servicio y comunicacion no efectiva, entrega con dos horas de atraso. Excellent service, the owner actually contact me since they didn't had the flowers described at the web page to offer the alternative to substitute the others. Very quick service and the flowers were beautiful. Muy eficientes, entrega mucho antes de la hora indicada para ser precisos. Un servicio de primera para los clientes. La transacción fue inmediata. Les felicito Marite. Bella's, bellas flores! Un día tarde debido a las muchisimas orden para enfermeras y madres pero al llegar me alegré un montón!! Un arreglo vivo con las flores multicolor y un muy moderno y artístico!! Gracias Marite!! Very satisfied with the flower arrangement beautiful flowers. But it was delivered two days before of what I specified. Absolutely will have Marite for my future flowers deliveries. 1. Paid for a balloon that was never delivered. 2. Requested same day delivery but it was delivered the next day. 3. Received an email at 11:00am on Saturday claiming the package was already delivered when it was really delivered at 7:00pm (8 hours later). 4.The name of the person receiving the gift was misspelled. 5.The name of the person sending the gift was not shown. The person receiving the gift didn’t know who send the arrangement. Fast, easy and very dependable service. My parents received everything I ordered and they were extremely happy. Thank you! Spot on! I ordered from Florida and they were able to deliver the next day. They did not have my orginal arrangement but were quick to let me know and offer suggestions. The arrangement was beautiful and I would use Marite Flowers again in the future. Thanks a lot for your comment, it was a pleasure to served you. Happy Holidays. I only giving a 4 because I had requested an arrangement on a romantic theme. The arrangement was beautiful but I added a balloon to it, and I was expecting something romantic a heart balloon maybe... Instead my girlfriends shows me a picture of a Happy Birthday themed ballon in the shape of tje cupcake with a candle. Great for a birthday but it wasn't the purpose for me sending tje arrangement. Very sorry but we do not received any specifications for the balloon, next time you order you will have a 10% discount. Thanks again for contact us. Ordered with no problem. My flowers were delivered on time and I was notified about. They are now my default option when it comes to send flowers to my hometown. Happy to serve you, thanks again for the order. It was a pleasure to served you, thanks again.